The predecessor of Muay Thai style called Muay Boran can be traced to XVI century Siam - now known as Thailand - where it was developed as a deadly martial art that can be used on a battlefield. Muay Boran wasn't limited by any rules and the sole purpose of that fighting style was to kill or maim the enemy soldiers using any technique available, including headbutting and other brutal strikes. It was an aggressive and a very effective style and a lot of Muay Boran fighting techniques can still be observed in modern Muay Thai. There is a legend about an experienced Siam fighter Nai Khanomtom which describes how effective Muay Boran was. He was captured and kept imprisoned during Burmese-Siam war in the second half of the XVII century. Since he was an expert fighter and a famous warrior he was offered a chance to get his freedom back if he defeats a Burmese champion. Nai Khanomton has knocked down the champion and the angered king has sent another 9 warriors one after another to beat him down but they failed to do so. Soon after the famous warrior got released by his captors and returned to Thailand. The day when he returned to his homeland is celebrated as The National Muay Thai Day. Whether you believe in this story or not the fact is that Muay Boran was a really lethal weapon in times of hand-to-hand combat and it granted Thais an advantage on the battlefield over the Burmese invaders. 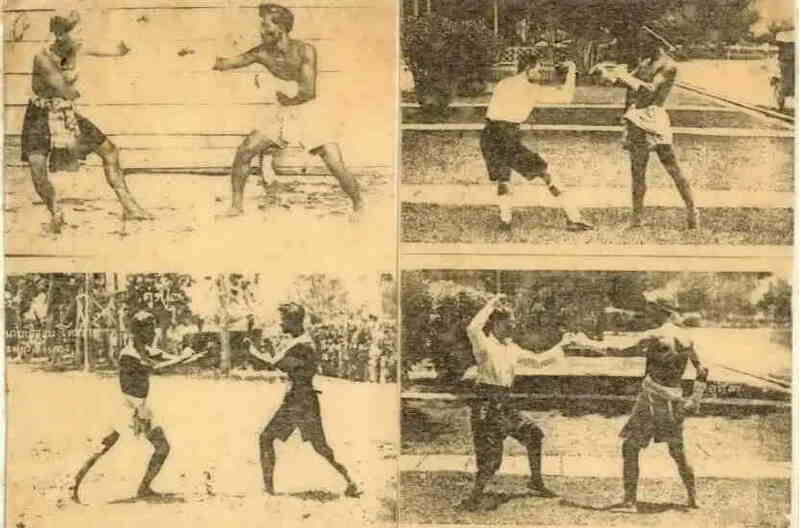 Western-style boxing was introduced to Muay Thai gyms. This, in turn, has influenced traditional Muay Thai styles. In 1920's new western style boxing rings were introduced. In 1930's a new set of rules was established following a tragic death of one of the fighters in the ring. Since then professional fighters must wear boxing gloves and foot protectors which greatly reduced fatal accidents in the ring. Prior to that date, the fighters used to wrap their hands with just a hemp rope. In the 1970's took place a famous match between Kung Fu and Muay Thai fighters in the Lumphini stadium in Bangkok. In 1995 the World Muaythai Federation was established. It was named that way since Muay Thai has the ambition to become an Olympic sport and the IOC rules don't allow the sport to have nationality in its name. Is changing sports name to "Muaythai" a sufficient step to include it into Olympic games remains to be seen. Another thing is that the Olympic Muay Thai may look like more like Dutch Kickboxing than a traditional Muay Thai. I based my opinion on an Olympic Karate and Taekwondo styles which are softer versions of its original styles. I'm holding my fingers crossed and I hope that the popularity of Muay Thai will prevail and it will become an Olympic sport eventually. Muay Thai has also become a crucial part of Mixed Martial Arts where it is used as the most popular stand-up striking style. This great success also became a curse since MMA overshadowed Muay Thai in Western countries, especially in the US. The biggest challenge now lies in making Thai Kickboxing more recognized not a part of the MMA but as a martial art of its own. A history of Muay Thai is rich with interesting traditions and events that shaped Thai boxing into a tough and competitive martial art it is now. The challenge lies in staying true to its traditions and be able to avoid stagnation at the same time.